With an Introduction by Dr Mark Jaccard, Professor of Environmental Economics at Simon Fraser University; Presentation by Guy Dauncey; and a Special Honouring of 10 of Vancouver’s climate action heroes. This is a joyous, hope-filled manual for facing the greatest crisis humanity has ever encountered. In his new book The Climate Challenge, Guy Dauncey shows how it is possible to reduce our global carbon footprint to almost zero by 2040, ushering in a new civilization that will be happier, healthier and more sustainable. Taken together, the Solutions represent an amazing blossoming of innovation that will change the world and create a host of new green collar jobs. Guy Dauncey is an author, organizer and futurist who works to develop a positive vision of a sustainable future, and to translate that vision into action. He is President of the BC Sustainable Energy Association. 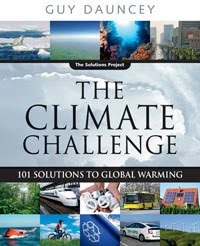 Signed copies of The Climate Challenge will be for sale at the event. and hosted by the Vancouver Public Library, with many thanks. This is a terrific labor. Nowhere will readers find a more exhaustive, yet accessible, treatment of the climate challenge. Guy Dauncey has created something unique in the current literature - if you wish to grasp the mind-boggling complexity of the climate challenge, read this book. A real cracker. Hugely informative, hard-hitting and very upbeat about the solutions. If you are wondering what to do about climate change, here is the answer. The Climate Challenge is not only interesting and informative, it is also exciting. Very timely and persuasive - an essential owner’s manual for our planet. This book is marvelous! The Climate Challenge is an elegant, insightful and comprehensive examination of the dominant global challenge we face. This attractive work belongs on the desk of every investor, entrepreneur, citizen and policy maker. It's as if Whole Earth Catalog had been reborn 40 years later. Guy Dauncey is deeply, urgently persuasive. Posted by Guy Dauncey at 4:08 p.m.